On page 233 of my book, I included a few sentences about the case of Ron Palmer, a Miami controller who was accused in 1980 of giving an instruction to a Braniff pilot that pointed him into a thunderstorm in retaliation for Braniff's refusal to honor controllers' requests for familiarization flights on the airline. I pointed out that an arbitrator looked into this case and cleared Palmer of the charge, which would have cost him his job had it been substantiated. But FAA officials distrusted the arbitrator's judgement and saw the case as one more example of growing militancy in the controller ranks. Now Ron Palmer, whom I had not had an opportunity to meet or interview before writing the book, has written to me to provide more documentation for his case than I was able to find in the records of PATCO or the FAA. He sent me his explanation of what happened and an interview from the period that further explains how he came to be accused and nearly fired. His story helps illustrate why so many controllers felt that the FAA was the aggressor in the year leading up to the strike, and why so many felt that they had to stand up to what they felt was government mistreatment. His communication with me and a link to the documentation appears below the fold. The pilot was never directed into any thunderstorm in retaliation for anything. He never got a bumpy ride. The arbitrator found the pilots response to my radar vector was "his" ambiguous statement, not mine. To this very day the FAA still puts out inflammable statements regarding this incident that was reduced to a common case of miss-communication between pilot and controller that had been completely blown out of proportion by the FAA. I decided not to send the original arbitration, outcome and exhibits. Over one hundred pages in all. I am sending you a copy of the "The Banner", Miami Tower PATCO's quarterly newsletter, dated January, 1981. It contains seven pages with Pennington's accurate article (although slightly slanted) about our big win. Pennington's first name was Larry, not "Carry" as he is listed on the front page. He was my best friend. He committed suicide in 1984. There were many key factors that took place during the time I was relieved of control duties and assigned admin duties prior to my actual firing. One stands out among the many. Rick Shultz, one of the supervisors, was told to make a cassette tape off the original spool and make it available to any controller that wished to hear it. Historically, whenever there was any kind of incident, system error, or accident, the supervisor would find the vital part of the recording, then back the spool up and record five minutes before and five minutes after the critical moment. When he did that he inadvertently recorded two additional Braniff jets I had worked where I had almost identical communication exchanges as I did with BN343. Clements and I both agree that if Shultz had not stuck to protocol of "five minutes before and five minutes after", the original recording by itself may have been to damning to over come. We don't think it was done on purpose. And that's just part of..."the rest of the story". As he explains, the document Ron sent is the January 1981 issue of THE BANNER, the quarterly newsletter of Miami Tower's PATCO Local. It is actually more informative in many ways than the arbitrator's report that cleared him. The local was led by Larry Pennington, whose suicide after the strike was a terrible blow to many PATCO members, including Ron Palmer. The issue contains articles by Pennington and Jim Hays (PATCO's first president). It also contains an interview with Palmer done while he awaited the arbitrator's decision in his case (the interview is dated as taking place on Oct. 24, 1981, when in reality it took place on that date in 1980, i.e. before the strike, which of course occurred on Aug. 3, 1981). The issue also contains a revealing article by Palmer on the Polish Solidarity movement led by Lech Walesa (and supported by Ronald Reagan), a struggle that inspired U.S. air traffic controllers. 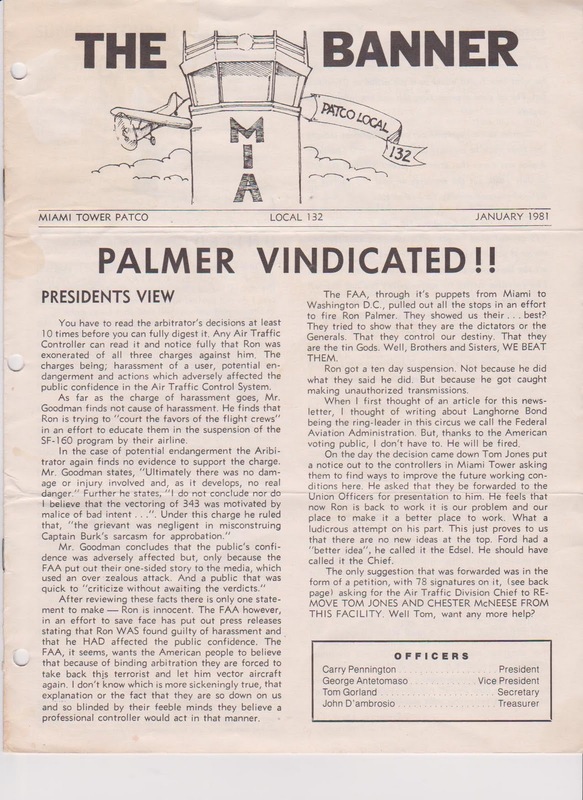 As one can clearly see in this issue of the Miami newsletter, the FAA's attempt to fire Palmer was among the grievances that angered controllers as they prepared to negotiate a new contract with the government as Ronald Reagan was assuming office. While Reagan sought and won PATCO's endorsement in October 1980, his administration never understood the sources of the controllers' anger or grasped its dimensions. 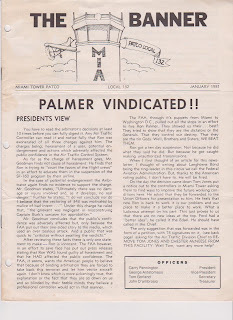 Thus in the months after this newsletter appeared the "common case of miss-communication between pilot and controller" that Ron Palmer refers to above would contribute to a deeper miscommunication between PATCO and the Reagan administration that resulted in the tragic confrontation that I describe in the book. Thanks to Ron for giving us "the rest of the story." Read THE BANNER by clicking here. This blog provides commentary and news regarding Joseph A. McCartin's new book, Collision Course: Ronald Reagan, the Air Traffic Controllers, and the Strike that Changed America (Oxford University Press, 2011). The book provides the definitive account of the most momentous labor dispute of the last half-century, the 1981 walkout of the members of the Professional Air Traffic Controllers Organization (PATCO), which was broken by President Ronald Reagan -- an event that altered the course of American labor relations and politics in ways that still echo in our times. I teach U.S. History, focusing on 20th Century American labor and politics, at Georgetown University, where I also direct the Kalmanovitz Initiative for Labor and the Working Poor. My books include Labor's Great War: The Struggle for Industrial Democracy and the Origins of Modern American Labor Relations, which won the 1999 Philip Taft Prize for best book in American labor history.